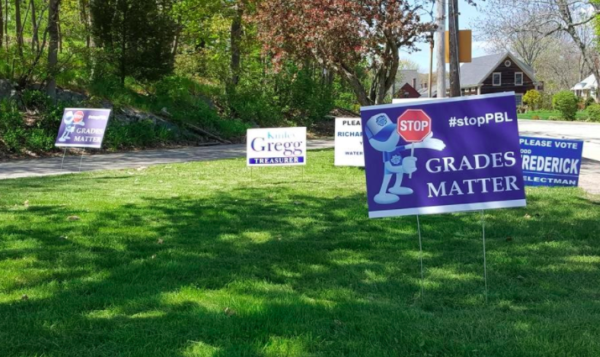 Bright blue signs sprouted all over town last week with a message that “Grades matter” and “No grades = No College.” Behind the signs are a group of parents deeply concerned about a new grading system at York High School they say will disadvantage their children in the college admissions process. While that is their primary focus, they are also concerned about the proficiency-based learning curriculum adopted for high school freshmen this year and reflected in the new grading system. The signs, they say, are their effort to open discussion in the community about what they see as a critically important shift in education instituted with insufficient input from parents. “The goal of the signs is to raise awareness,” added parent Beth Dimino. The School Department has been mandated to follow a state law that passed in 2012, which requires schools to provide a proficiency-based diploma to all students by 2021. A proficiency-based curriculum involves breaking coursework down into distinct learning “targets” that students have to be proficient in. While other school districts – like Kittery and School Administrative Unit 60 (Noble High School) – began to make the shift immediately after the law passed, York did not. York began building up to proficiency-based curriculum about 18 months ago, hiring a second high school assistant principal to help with the task. The high school held a series of parent information meetings in January 2017 to outline its plans, but parents said they have heard almost nothing since. With a shift this momentous, they said, a lot more feedback is needed. Of primary concern to the parents is the grading system adopted by the School Department for this year’s freshmen. The department instituted a proficiency-based grading system of 1-4 with 1 representing not proficient and 4 meaning a student exceeded proficiency. But it doesn’t translate into D, C, B and A, say parents. A grade of 3 is proficient, and they said it is unclear to them how students exceed proficiency or what it means. The PBL grading system “is out of step with nationally recognized norms and to the extreme of what other schools in Maine are doing,” said Julia Glidden, a parent whose son is in private school but who wants him to go to York High School. Not everyone agrees with the parents’ assessment and there has been a lively online debate in the past week about the efficacy of the PBL diploma. At one of the January 2017 meetings, University of New Hampshire admissions director Robert McGann said he has never seen a student with a PBL diploma treated differently from other students. Beyond grading, parents say they have issues with the way the proficiency-based model has been rolled out in York. They mention teachers who say they are tied to a computer software system that makes it difficult for students to become proficient in a particular target, that students are not motivated as much as they should be because they are told 3 is proficient, that they are not given homework and other issues. Interim Superintendent of Schools Mark McQuillan said he does not and will not dispute parents’ concerns. Bernhardt said she is already looking at making changes in the grading system for next fall. “We can absolutely be reporting in both measures,” she said.